A couple have been reunited with their holiday money and flight tickets thanks to a "mystery Good Samaritan". A plastic folder with €540 (£498), a holiday itinerary and flight boarding passes from Manchester to Rome were left in Royston Police Station's postbox in Hertfordshire. Andrew and Josephine Minshull, named on the passes, were eventually tracked down to Warrington, Cheshire. Mr Minshull said he "can't believe honest people are still out there". 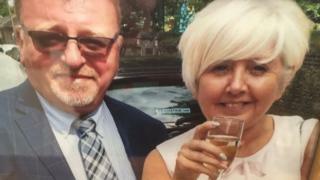 The couple had been attending the wedding of Mr Minshull's nephew in late July when they stayed at a hotel in Royston and he believes he lost the items when packing up the car to make the 180-mile trip home. To find the couple, Hertfordshire Police first checked the local electoral role and found one man with the surname in Royston, who said it originated from Cheshire. That led them to an address in Warrington and after Mr Minshull answered a few security questions, it was clear they were the owners and he picked up the money earlier this month. Police community support officer Penny Tomsett said: "We are over the moon to have been able to reunite Mr Minshull with the folder. Royston is a lovely town and most people here are still very community-minded and honest. "I would also like to take this opportunity to thank the mystery Good Samaritan who put the folder into the police postbox." Mr and Mrs Minshull were still able travel on their holiday to the Italian capital.